What’s better than having just one title fight headlining a pay-per-view broadcast? TWO! On Wednesday, it was announced reigning flyweight champion Demetrious Johnson (pictured) will put his strap up for grabs against Chris Cariaso at UFC 177. The 125-pounders will serve as the opening act for the bantamweight rematch between champion TJ Dillashaw and Renan Barao. The UFC announced the matchup Tuesday via Twitter. 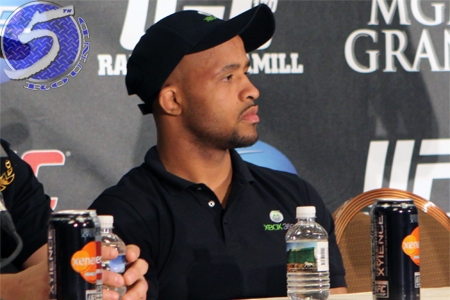 Johnson will be making a quick turnaround from June’s unanimous decision victory over Ali Bagautinov at UFC 174. The win marked “Mighty Mouse’s” fourth straight title defense. Cariaso will be riding a three-fight winning streaking into the biggest bout of his life. “Kamikaze” earned his crack at the crown on the strength of May’s split decision over Louis Smolka. The August 30 event takes place inside Sleep Train Arena in Sacramento, California.